I feel this overwhelming urge to reach out to your website, and I am not quite sure exactly why. I’m working my way through reading pretty much your whole website, or at least the articles which strike my eye as I go through it. It is one of very few things in my life right now that helps me to feel a little less alone. I told my life partner (of almost 7 1/2 years) that I was done with the relationship in January of this year. I gave her pretty much no warning just sat down one evening and told her I thought we should break up. She claims she saw it coming, but I think that’s a lie. Judging by how quickly and the lengths she suddenly was willing to go to in order to “work it out” right at first, I don’t think she ever thought in a million years I’d get the courage to leave that prison, and she certainly had no problem ignoring my requests for us to try to work on things, try counseling again, try whatever. She had told me flat out that she was not interested in working on our relationship. I think she just thought I’d stay, forever the devoted girlfriend, forever her caretaker and provider. I tried really, really hard to make the breakup as amicable as possible. Told her we could stay friends. I was willing to try a variety of arrangements if she thought it could work out she is on disability and has limited means without me, and we had a whole mess of dogs, plus she was forever bringing people into our house who were somehow down on their luck (and subsequently making them practically her indentured servants in the process), and at that time we had two kids and two other disabled women under our roof. In no way did I want to put everyone on the streets! The truth is, I was miserable, and had been for awhile. She was my first girlfriend, whom I met at a very vulnerable time. I wasn’t even really out of the closet yet. She is 18 years older than me. She saw my very messed-up self coming a mile away, and pounced. I realize this now. For over seven years, I tried to make this relationship work. I truly loved her my love was real! Even as I know now that hers was not. And over those years, as I cared for her through her numerous health problems (many real and some I found out fake), she wore me down to a shadow of a person. We would have a few good times, usually when she really needed me, or right after I was getting to a breaking point. We tried joint counseling once, which seemed to work then (but she would years later throw in my face as being some horrible experience where she was victimized, much to my bewilderment). And I worked hard to support her and the constant stream of people and animals she wanted to reign over, even when it was more than we could handle, even when she would bring them home without my permission, even when she would reel them in expressly against my wishes. Our relationship took a nosedive that never corrected itself in 2013, during a time that had seemed to me to be relatively positive. We were getting along pretty well and she was being minimally affectionate. Then I accidently found the Facebook messages on her phone. She had helped her ex move across the country to the next town over, and was spending EVERY DAY with her while I was at work. Even talking to me on my lunch breaks while with her. This had gone on for weeks, and she had been intentionally deceptive about it. Racy, somewhat explicit messages, sent from her ex, even describing how the ex wished I wasn’t in the picture. There is no way to describe that feeling if you have never felt it. And I was so naive, so trusting, that at first I literally thought the ex must have hacked her Facebook and was messaging herself, just to torture me. But when I read more, there was no way. There were things said about recent happenings that the ex would not have known about. You know you are under someone’s control when something like this can happen and they can so easily convince you that not only is it not REALLY cheating (because they supposedly never slept together), but it’s also all your fault. 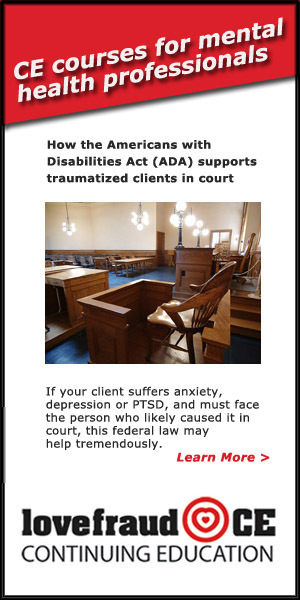 My partner and her ex made quite the pair … both disabled, both at home all day, while I worked to try to support them. As always, we ended up with more people being paraded through my house temporarily to stay when they were down on their luck. Over a span of a few months I had three different people come to me and tell me that my partner and her ex were secretly actually together, and they just weren’t going to leave me until my partner’s disability went through (her ex already had SSDI). The first time I confronted her and she said the person saying these things was just stirring up trouble. The second time she had the same answer. By the third time, I was like, look. THREE TIMES!! What is going on? And her answer was that her ex must be going out and saying these things to these people. But she had no desire to do anything to fix the problem said she would just talk to the ex, but there was no mention that the ex needed to leave. As if that weren’t stressful enough, I also have two neurological disorders and an autoimmune disorder. Because of my health conditions and the stress in my life, I was having to pull into parking lots on my drive to work just to take naps so I wouldn’t wreck driving. I was exhausted physically, and emotionally I was at the end of my rope. There was just NO WAY to make ends meet. I couponed like a crazy person. I made my own laundry soap (with that many people and animals, laundry soap was a huge expense). For awhile I was buying cigarettes for three people (I don’t even smoke), and eventually I refused to do so any longer and bought a machine and tobacco and tubes…but then my partner refused to roll her own (said she couldn’t figure it out) so then I was stuck 30-60 minutes a day rolling her cigarettes so I wouldn’t have to buy them. And still all our bills were behind. I often went without some of my own medication because I couldn’t afford it one medicine in particular is quite expensive even after insurance. I could barely keep lights on and the house out of foreclosure and gas in my car to get to work. The stress was unbelievable. I felt like I had the weight of the world on my shoulders, with so many people and with my partner’s health issues and with all the animals. So many times I seriously considered ending my life, just so my partner could maybe make ends meet with my life insurance policy. And of course, I received no emotional support. Rather, I was criticized for how I interacted with everyone else in the house. Criticized for getting so upset at the ex (you know, for doing things like starting rumors that I was pregnant and cheating on my partner). Criticized for not being able to control things going on with the family living with us that were bothering my partner. Two times I sat the mother of this family down, at the request of my partner, and said, look, we need to start planning for you guys to move elsewhere. Then I’d go to work and my partner would make amends with them and agree to let them stay longer … making ME the bad guy and her the compassionate one, of course. The worst part was, I really didn’t ask for much. Intimacy was long gone, per her refusal. I tried repeatedly to understand what had happened to our relationship, and she literally refused to even discuss it with me. Every couple months I’d simply ask if we could talk, and would be met with an immediate and angry, “Oh Jesus F—ing Christ, what now? !” I mean, how do you even respond to that? I can honestly say, I gave everything I possibly could to make that relationship work. I gave far more than any reasonable person would have. Despite the fact that she refused to marry me when it became an option in my state, I still considered her to be my spouse. I took the promise I made quite seriously. I begged for us to try couples counseling again but she wanted nothing to do with it, or our relationship, until I finally decided I couldn’t go on like that. Literally, I couldn’t…it was going to kill me, or I was going to kill myself, and I saw no end in sight because she was continuing to do the same things over and over. Beyond the fact that I just couldn’t continue on like that, there was another factor that contributed to my decision to get out. I found out early this year from a relative that quite a few things my partner had told me about herself and her past were untrue. I had already been told that my partner’s story about being raised by her Native American great grandparents was untrue … in fact that these relatives never even existed. I had already brushed that aside, thinking maybe I was being told wrong. I even got a subscription to Ancestry.com to try to research it myself (working on her family tree) and couldn’t find these people anywhere. It struck me as strange, and I decided it had to be a misunderstanding somewhere. Maybe she had been told these people were grandparents, and they were just an old couple in the community. Surely she wouldn’t LIE about something like that! The biggest lie was about her military background. She supposedly spent 13 years in the Air Force, worked on nuclear weapons, worked in NATO, was trained as a profiler (think Criminal Minds), was trained by the military in martial arts, and had been deployed all over the world. This was such a huge part of her identity, and she claims to have PTSD from her experiences. Then I found out in a conversation with a relative that that was a complete load of crap. She was in the military 4 years, and never left the country. She was a cook. And she was not honorably discharged. Once again, my world crumbled. I could not fathom that she had lied to me in this way for so long. I wracked my brain, trying to find an explanation. Maybe she has a delusional disorder! Maybe that was why so many times her stories of her military experience sounded so similar to things we just saw on TV … maybe she couldn’t help it, maybe her brain was confusing her! But I was able to confirm at least part of this to be true, through the SCRA website. Her military service began two years later than she told me it had, and lasted four years and one month. Definitely not the 13 years she had been telling everyone. Regardless of the reason, and regardless of how much I loved her, I could not stay in a relationship where nothing was as it seemed. I knew better than to confront her about the lies —she had an explosive temper and hated to be challenged. So I just sat down one night and told her I was done, it just wasn’t working, and I was as gentle as possible. At this point we had fewer people living with us, but two of them were minor children, plus all the dogs, and I wanted to make sure they were all cared for. I said we could try being roommates (that didn’t go over well). I decided I would just move out and let her stay in my house (the mortgage is only in my name and predates my relationship with her) and I’d help her get on her feet financially, and as long as she could within a few months handle the rest of her bills through her SSDI (which she was finally awarded) and rental income, I could still pay the mortgage and then the rest of my bills at a new residence. No option was acceptable to her. She started alternating between trying to work things out (saying she wanted to marry me now, wanting counseling, etc.) and just going into frightening raging lectures, which lasted HOURS. Her behavior really started to scare me. She began using sleep deprivation as a primary means to wear me down, which is especially cruel because I have narcolepsy. She would lecture me for hours, into the early hours of the morning, with me just begging her to stop and let me sleep. And she would change from threatening all sorts of stuff, like threatening to take legal action against me or destroy my belongings or prevent me from using our vehicles to get to work to threatening to try to get me fired from my job or even threatening to harass my family. I had gone off some of my meds, including my antidepressant, due to side effects, which were affecting my other conditions, so she kept saying I was just crazy and had me terrified she was going to Baker Act me. 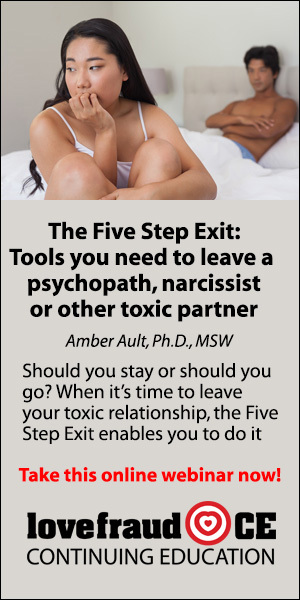 Her behavior had already been controlling for years driving me away from friends and family, controlling all my time, but it got so much worse. I had to talk to her on the phone on my way to and from work and on my lunch. She would get angry if I tried to have any sort of private phone conversation ever with anyone else. She threatened to try to ruin every person who ever helped me said she was going to have my psychotherapist’s and my massage therapist’s licenses revoked due to some imaginary malpractice. She repeatedly accused me of cheating on her, with a million people, even with men! I was selfish, I was making her and the dogs and the people staying with us homeless. I was ruining everyone’s lives. My dogs would end up dying if I took any of them with me b/c I wouldn’t be able to take care of them right. She told me I could only take the one with me that I had before meeting her, even though others were microchipped in my name. I was so terrified, some nights I’d wait until she fell asleep and sneak out and lock myself in a vehicle to call the domestic violence hotline, and they recommended I speak with a police officer. When they transferred me to the police, the officer told me that if they came out the best they could do (since I hadn’t been hit, of course) was recommend to me that if I feel unsafe I should leave MY OWN HOUSE, regardless of the threats she was making and the sleep deprivation techniques which were literally putting my life in danger the next day when I would drive because of my condition. Without my dogs, of course, b/c they couldn’t come to the shelter. Why would I just make my partner even more angry by waking her up with the cops there when they couldn’t do anything to help?! I refused to leave without as many of my dogs as I could get (which ended up not being very many, but was more than one at least), and until I could safely leave with them I couldn’t give her 30 days notice to be able to evict her. There was no way I could deal with her for 30 days after telling her she had to leave! No way on earth I would be able to live through that, not emotionally, and possibly not physically. She was already starting to do things like poke at me and put her hands on me when I was trying to sleep despite me demanding she not touch me and she even blocked me in a hallway once for speaking to her best friend who was in our driveway working on a vehicle. I knew she wouldn’t just hit me she was too smart for that. If she were to become physically violent, it would happen exactly one time, and I’d be dead. It took me two months, but I found a house that I could buy on contract near my job (45 minutes away from where I had been living). She insisted on helping me get the house ready she changed the locks (so she of course still had a key to the new house). She packed my stuff (and therefore decided what did and didn’t get moved). She helped with some minor work that the house needed before I could move in, so she did all this under the guise of being so helpful and supportive while I was ditching and abandoning her of course. But I did manage to get out, with a few dogs and a few basic things. We had five vehicles between us she took them all except the one we were selling on payments to her best friend. Thankfully he is a good man and gave me the car back so I can get to and from work, but I am going to have to make it right with him for the sake of my own conscience and make another arrangement or pay him back the money he paid HER for this car so far. She did whatever she could to try to leave me with nothing. Once I moved out she began the stalking calling, texting incessantly. Terrifying me. Threatening all sorts of things again. I eventually had to change the locks (which really angered her) and get a protective order against her, which was a difficult several month process with a lawyer and a legal advocate from the local domestic violence shelter. Since she can’t contact me, she has proceeded to harass anyone who has remained my friend, including having them arrested and making false and exaggerated CPS reports to get a friend’s kids taken away for two weeks (they have of course gotten them back now). It makes me feel like a liability to have as a friend. It’s horrible. After the last court date, when the protective order was made permanent (2 years), I reached out to a woman that my partner (now my EX) knew years ago. I was desperate to figure out what had just happened to my life. I found out that this woman, let’s call her Ann, only knew my ex for 6 months, but I was the fourth woman she knew of who my ex took practically every penny from and tried to destroy their life. Her lies were more extensive than I had even realized, and Ann told me that the last time someone reached out to her trying to find out information on my ex, it was the parents of a girl who my ex TRIED TO KILL. “Someone” poured diesel under this girl’s house while she was asleep in it. She got out, two of her dogs did not, and she subsequently had a nervous breakdown. They couldn’t prove it was my ex, but it was clearly arson, and I can’t tell you how many times my ex would say to me things like that she could just burn down the house of this or that person she was angry with and nobody would ever know… So, clearly, my determination that my ex would only get physically violent with me exactly one time was spot on, as this is what happened to this girl prior to me. There is so much more I could write…I have a long way to go, but I am slowly getting there. So why am I writing this now? I want someone else to know how bad it was. And it was bad. So many people just look at me like I am crazy if they hear even the smallest detail of my situation. But it is real I lived it and I am still recovering from it. I want people to understand that this happens in gay and lesbian relationships also. There is very little out there about domestic violence in the context of lesbian relationships, and even in the LGBT community there is often little recognition of it. I want others to know that it does get better, although not always in the timeframe we would like. I thought it would just magically be better when I moved out, but it actually got harder. I didn’t anticipate how hard it would be for me to be alone. I had no idea who I was anymore or how to make even the most basic decisions. I was like a zombie paced the floors, slept all day, couldn’t eat. Lost tons of weight. I spent many, many nights on the phone with domestic violence and suicide hotlines. Add to that the fact that my ex’s stalking and threats only escalated when I moved out (and she refused to leave my old house or give me access to it for awhile as well) and the difficulties I had in getting a protective order … it was just tough. But I was tougher. I somehow made it through. I am a little bit amazed at my own strength, to be honest, because I went through hell, emotionally, mentally, spiritually, physically, and financially, and I am still here. I survived and persevered, and even made some important decisions along the way to protect myself. I am not where I want to be yet, but I do know where I will never return. Thank you for sharing. Like so many others on here, your story sounds eerily similar to my own. The sociopath I escaped conned the local church’s pastors into providing food and money and even appearing in court by telling them that I abandoned the sociopath and our children with nothing. The reality was that I left the sociopath everything, including a fully stocked pantry in a fully furnished house, when I left so our children would have whatever they needed during their visits. When the sociopath had to move out of our house (it is being foreclosed), another church lady from a different church was conned into furnishing the new residence because the sociopath just walked out the door and left a fully furnished house (and the children’s pet) behind, telling the new church lady that I abandoned the children and implying that the sociopath had full custody when in reality we had joint custody and the children resided with me. Sociopaths come in all shapes and sizes. Men, women, homo- hetero- bi- and trans- sexual, the behaviors are astonishingly similar. Best of luck to you and be careful, especially since she knows where you live and is familiar with your house and its layout. Sekeroflight, my mouth dropped reading your post. You have been to hell & back over and over with this evil crazy sociopath. 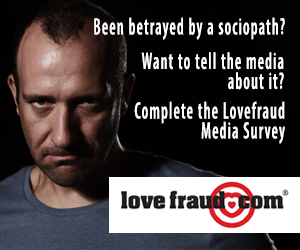 So glad you escaped this sociopaths crazyville world and found your way to this wonderful site called Lovefraud. My ex was the exact same with regards to moving people in or bring them on vacation or work events with us. There was never a time to relax or enjoy life because he created so much drama, chaos, confusion all to control EVERYONE. He was a mini cult leader exactly like your ex. He controlled everyones time so that we could not see what was truly going on = a con game. I am sooooo sooooo happy that you crawled away from your ex. What a nightmare. You are free now!! I too (like most victims of a sociopath) was absolutely mentally, emotionally, & physically exhausted by my ex and his drama, choas & none stop mental games. I literally crawled out of his hell & like you could not sleep & had high anxiety due to the hell. I was lucky enough when I left my husband (now ex thank goodness) to be guided by a friend to a counselor who finally told me the truth about my h & also I was guided to a hormonal specialist to heal my body from the years of stress that my ex had me under. Please look into adrenal fatigue as your root issue for sleep issues, anxiety, depression, etc. The adrenal glands regulate the body’s blood pressure, blood sugar, cortisol & adrenaline levels and over 50 hormones including all the female hormones such as estrogen, progesterone, testosterone. Under continual stress such as a toxic abusive relationship the adrenal glands work over time and eventually burn out causing a long list of symptoms such as sleep issues, anxiety, panic attacks, memory loss, mood swings, depression etc etc it’s a long list. The good news is your adrenal glands can heal within 6 months to 2 years with a good clean diet, vitamins/minerals, hormonal balancing (no big deal just pills or cream) and plenty of rest & relaxation. **Get tested from a endocrinologist doctor or bio hormonal doctor = cortisol levels test, hormonal imbalance test, thyroid T3 & T4 testing, vitamin/mineral deficiency test. 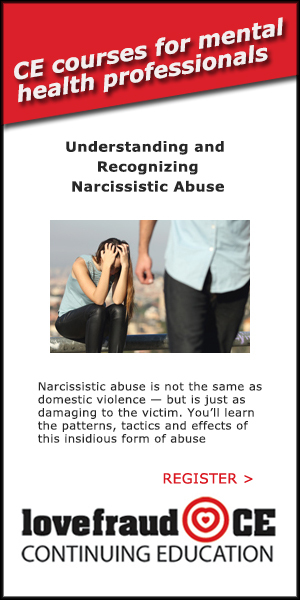 This is the missing link to healing from a domestic abusive relationship. You are right outsiders of this kind of hell do not get what we endured on a daily bases. It’s absolute craziness on steroids!! 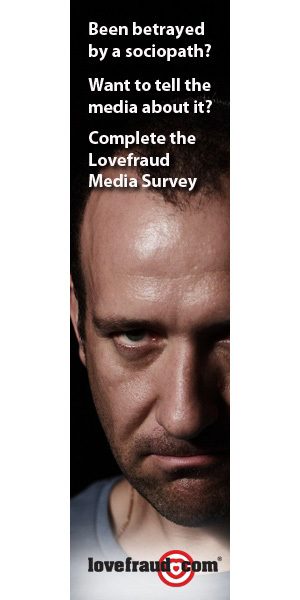 Glad you found your way to Lovefraud. Seekeroflight….WE HEAR YOU!!! WE BELIEVE YOU!!! Wishing you all the best with your recovery!!! Cult leader is exactly what she is. She preys on people who have some sort of need- maybe they need transportation or a place to stay or some groceries, and she helps them out like she is this kind benevolent soul. And then they owe her a debt they can never repay. They are like slaves or indentured servants, it is insane. And she can con anyone- social workers, medical personnel, anyone. Well, the cops are starting to get tired of her antics, so there’s that…but she is still basically raising two kids who aren’t hers (we had an informal arrangement with their mom basically, after my ex just kind of brought the kids home, the first one without even asking me and then guilted me into taking in his sister too) and watching the craziness of that situation was another reason I got my self the heck outta there…it was just insane. I wanted to look into being foster parents or something with some legal structure to it. She just wanted to take people’s kids and make her own rules, and with these last two she had manipulated their mom so badly that I could hardly stand it. She (their mom) is also disabled, including learning disabled, and easily manipulated, and she was going to sign over power of attorney to my ex for HERSELF. (At this point this may have already happened, I don’t know.) When the mother would talk like she was going to take the kids back from us (which she had EVERY RIGHT to do whenever she wanted for whatever reason), my ex would say to me, Oh don’t worry, once she signs over power of attorney to me for herself, if she tries to get the kids back I’ll just have her locked up in a psych ward. !!!! I mean, you can’t DO stuff like that! When I left I called CPS because I was worried about the kids, but I have no doubt she smoothed that over with the social worker and made me the bad guy. I’ve seen her do this stuff too many times. She also has power of attorney over another disabled woman in her 50s. When that woman got out of rehab at a nursing home I guess the social workers saw no problem with making my lovely ex this woman’s power of attorney. Cult leader- that pretty much sums up my ex…she has her slaves and her minions and continues to grow “her family” by whatever means necessary, and demands absolute loyalty from everyone, and nobody can talk even to one another about what is going on. I am very fortunate to still have just a couple of our joint friends, who saw the reality of the situation, and one of whom was punished royally (or at least she really tried to) for remaining my friend. Everyone else, including her family, thinks I’m crazy and horrible and have destroyed her life. It’s heartbreaking. Seekeroflight, is your ex stealing all of the money from these children & adults that move in? It seems that they all might get some type of monthly public government assistance because of their mothers disability or because of their own disability. Your ex might be committing a illegal act by gaining power of attorney & this would be the area that the social service agency should look into. Or even report it to the FBI to see what they find out. Your ex is a con artist what better way for her to secure financial means then to control someones income with a power of attorney. And while you paid all the bills is it possible that she was putting money in a savings account for herself? Think about this because these are the things these con artist do. She was controlling you by having you do all the daily chores, by bring people in for you to take care of & by you using your paycheck so that you could not save money to leave her. As for “no one can talk even to one another”…this is exactly what they want…if everyone in a cult or abusive relationship talk they could share stories and see the truth much sooner. It is very common for a sociopath to use “sociopath triangulation” (do a search on LF & google) & “sociopath smear campaign” (do a search on LF & google) to control everyone. My ex was masterful at this along with pity play manipulation (do a search on LF & google). A cult leader does not want you to think on your own this is why your ex keep you busy all day long with taking care of others and not yourself. Don’t worry about what your ex’s family & friends think, they will see her next vicim say the same things you are saying & hopefully they will see the truth. I know this is one of the hardest things to deal with when you end the relationship the smear campaign is emotionally devastating because the vicim is the good one while the evil sociopath makes it out like they are the vicim but know that you ex was creating a smear campaign against you from day one this is what they do. This is what my ex did too. It was hard when I first left because no one believed me they all took his side. But the more I learned about his disorder & his con game the more I did not care I was happy that I escape the hell & I know that the others will see the truth about all of his lies. I am so glad that you are way from this evil sociopath & so thankful that you had the strength to search for answers which lead you to Lovefraud & post your story. The disabled woman my ex has POA over is actually the mother of a friend of mine, a guy who my ex used to consider her “adopted son.” She has screwed him and his family over almost as bad as me actually, and has brainwashed his mother against him. It’s truly horrible. One of the last times this woman was hospitalized and he tried to go see his mom when he found out, my ex refused to let him see her, and he filed a complaint at the hospital out of concern for his mom’s wellbeing. Since I’ve already made a CPS report regarding the kids I really don’t know what else I can do, if anything, where the likelihood of my actions doing some good actually outweigh the likelihood that nothing will be done, I will look like the crazy ex, and my ex will be all the more angry with me and seek revenge in some way. The kids are my biggest concern of course. I really care for these kids. I’m also terrified, b/c it’s been so long now since I’ve seen them that God only knows how she has lied to them about me. We had set up with the kids temporary guardianship when we were still together (through notarized paperwork with a lawyer and their mom), at my insistence, because I was not going to have kids under my care without some sort of document showing the agreement we had with their mom. It was something that any of us could back out of pretty much at anytime, but it allowed us to pick them up from school and talk to teachers and doctors and that type of thing. When I went to leave my ex threatened that she would sue me for abandonment of her (b/c she’s disabled) and the kids, and I’d have to pay tons of money in child support, etc. She had me TERRIFIED. (Of course none of that was true, our informal arrangement means nothing in the courts I eventually learned.) I come from an ethnic background where the police and courts are pretty much avoided at all cost- everything is dealt with within the community whenever possible. My parents did end up divorcing, but it was a very rare thing for my family and happened after I was already an adult. She knew my fear and ignorance of courts and the legal system and really tried to capitalize on that. But yeah, it’s a matter of picking and choosing my battles. She is sooooo convincing, and is claiming to everyone that the whole problem is that I am crazy and am terrorizing them all and abandoning them (not sure how one can do both at the same time lol, having no contact now). And they aren’t my kids. I have zero claim over them. They are kids who happened to live under my roof for a few months. I can’t force CPS to take me seriously about my concerns- they are just going to believe her. I feel like my hands are tied. Ugh. I type this all so nervously, afraid she will read it all even without my name (or hers) attached to it. But it is therapeutic to talk about it, and I hope by talking about it maybe it will help others as well. Even with a protective order against her I’m still scared of her. Then again, even if she did read it, she may not want to draw attention to it to anyone else b/c she never wants them to hear what I have to say. Keeps us all separate, lest we compare stories and figure her out. When I took her to court for the protective order I figured she’d come with a million people in support of her- her family, our friends, the kids. I was so scared. Then she came all by herself…I was really surprised, but realized there was no way she would risk anyone hearing or seeing the hard evidence I had of her stalking or the things she had said to me in text messages…or hear the phone calls I had recorded (we are in a one party recording state, and she already knew from an encounter with the police that I had at least three recorded calls). For as smart and smooth as she is, she sure said some pretty stupid and incriminating things in text message. That paradox continues to boggle my mind. Catnoch, I think it is good that you have weighted both sides and like you state you have learned to pick your battles with her. You did the right thing by reporting her to CPS and now it is in their hands to protect the children. I did the same in a way I warned all three of my ex h mistresses after i left him when I learn that he was a sociopath, I felt like I needed to give them the truth and after that it is up to them to warn the next victims of his. Despite them cheating with him during my marriage (2 knew he was married) I learned that they were conned into his con game just like I was. Sociopath are not smart we just keep turning a blind eye to their crazy behavior because we had no clue what to do as we all were so flabbergasted at what they were saying or doing…one min they seem “normal” the next second they are crazy again. Now you are seeing the truth in her behavior and not giving her a second, third, forth change to correct her behavior & and you have taken off your rose color glasses to see exactly who she is…this is a good place to be! Why do you think your ex would read this site & your posting? oops sorry seekoflight, I posted a comment to you under catnoch. It sounds stupid, but I feel like she is all knowing sometimes. She lectures and interrogates so severely and she can make you think she knows something that you haven’t told her (when in fact she has no clue or maybe just suspects something) but you think she must know by how she is talking and then you end up telling on yourself. It was actually one of her friends who helped me really understand this, after I left her, because she would go to him asking questions trying to get info on me or trying to get messages to me with the hopes that it would upset me and then I would slip up and tell her something thinking she already knew (especially before I went no contact). She fishes for info that she can nail you with. And her hours and hours of lecturing and interrogating can really wear you down. And there was no escape. I could be literally completely under my blankets, shaking, trying to not respond at all other than to ask to please be allowed to sleep as it was 1 or 2 AM, and on she would go. Didn’t care who might hear. A normal lecture or interrogation was at least two hours. She would throw in there completely inappropriate info with others within earshot, like making fun, literally mocking me for intimacy issues I had when we first got together for very personal reasons, within earshot of a teenage boy’s bedroom. When I told her she was being inappropriate she said he had a right to hear it (?!?). 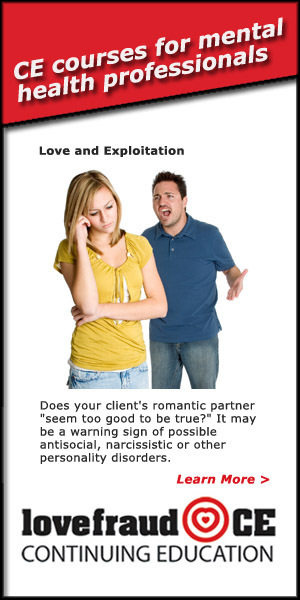 I managed to mostly avoid this stuff, it rarely happened to me, until I told her I was leaving. But it happened enough that I knew what it was and that I needed to avoid it. Before I could move out this year it became an almost nightly thing for awhile. Was even worse for a week and a half during the winter when she refused me access to a vehicle, insisted on driving me to work both ways (45 min each way, sometimes I would manage to get a ride with a coworker halfway home which would make her mad), and she wouldn’t let me have private phone conversations at home and demanded I call on my lunches, so my only connection with the world was to email and text on my phone under my blanket after she fell asleep or to call my dad on my bathroom breaks at work. For a week and a half. It was like being held captive, even though I went to work. I had to play her game, or I would have lost even more than I did. Jesus…how did I end up there? It sounds ridiculous reading it. How is this my life? I think I played it well though, really. I am living in a second house that I am buying on contract (had to have a place to go with my dogs- shelters were out). And my old house almost went into foreclosure, but it will be current in one month. It looks like I managed to save it, have post dated payments set up with my lender. And I have renters in it who will be paying rent starting next month, friends of mine. I moved to where I could bike to work in less than an hour if something happens to my car. She tried to keep me dependent on her for transportation. And the dogs I could get out with are better cared for now than they have ever been. I will be OK, financially. I will get back on my feet eventually. It is emotionally that I struggle. In my head she is still there, all knowing, all judging, all punishing. The sleep deprivation combined with the eternal lectures are awful. I endured the same, with the sociopath sometimes going on for 8+ hours at a time. When I would fall asleep during the lectures, I was allowed to sleep for just a few minutes before being awoken. The disruption of sleep cycles is even more debilitating to the brain and body than not sleeping at all. I trembled all the time and could barely form coherent sentences. This is the point at which I escaped because I was in fear for my life. You may think you are alone, that no one could possibly understand what you have gone through, but we understand better than you think. Getting a sociopath out of your head is a hard thing. It may sound ridiculous the way we tout No Contact over and over, but such a simple thing really does provide an enormous amount of healing. Eventually you will achieve clarity. It sounds like you are well on your way. Keep venting here. It helps to get the story out with people who believe and understand you. Hugs. It WILL get better. In the end the no contact part wasn’t as hard as the “staying off her facebook” part. I’ve refrained from that for a few weeks though now too. At first I wanted to be prepared if she was planning something, but it became clear that if there was anything worth knowing on her facebook it wasn’t posted publicly to her profile, and I was using an accout other than my own (which she is blocked from) to see. But the last time I caved and viewed her facebook it just upset me way too much, plus I saw a recent pic of one of my dogs, and it just ripped my heart out. That’s one of the hardest parts right now, missing my dogs she wouldn’t let me have. I was very bonded to a couple of them, and I really tried to get them, even involving the police, with no luck. Fifteen dogs, that I financed and provided care for and many of them raised from pups, and I was LUCKY to get out with the four I have…two of them were dogs that drive her nuts and that she really can’t handle. And she used the rest of the dogs against me so many times before the protective order was issued- calling me and texting me that they were sick, dying, had run away. I didn’t want that many dogs, but once they were there I loved them very much. She knew they were my weakness. I feel like I abandoned them. It makes me physically ill to think about them, so I try not to. Before I moved out I felt so crowded, even in my own head. Our house was NEVER quiet- even beyond all the dogs and people living with us and the fact that my ex couldn’t stand to let me have a minute to myself, she always also had people over. She loved to have just huge groups of people (especially with kids) over to sit and drink coffee and talk and listen to her stories. I felt like I couldn’t even think my own thoughts b/c the entire world didn’t have room for them. I wanted just a minute of quiet and aloneness. But now being on my own, with just a few dogs and no people, I just about lose my mind. I don’t have thoughts- I have anxiety. The silence is deafening. I can’t function. Now that I have space to feel my own emotions, they are so overwhelming that they threaten to take me out some days. I have yet to have a single other person to my house, other than my dad and sisters and my ex and a friend who did some work on it before I moved in. My family lives hours away. I’m afraid to have anyone else over, afraid to invite them into my space. I’m not even sure why- it’s not like I’m without friends, and it’s not like I’m not lonely. I could realy use the companionship. It’s almost like I feel like my space is no good. Maybe nobody would want to be there. My house is still pretty pathetic- needs new windows (lots of plywood to cover broken glass, and I can’t afford to replace them), needs cosmetic work that I can’t afford, is so sparsely furnished that it’s embarassing. I’m grateful for it, don’t get me wrong…it was available at just the right time when I needed a place for me and my dogs, and I’m buying it on contract with terms I’m pretty happy with. But I can’t help worrying that people will look down on me for it because it is so emblematic of my whole situation. And I’m so afraid of somehow inviting negativity and drama into my space that I’m pushing away anything good as well. I’m afraid of meeting someone new- the thought of trying again with someone new makes me want to vomit…unless it is someone I already know and trust, and there isn’t an option like that right now anyway. I miss companionship, but I’m so scared of people. It’s the most hopeless, horrible predicament. I just want to cry. Having a rough day…can you tell? No Contact includes virtual contact like looking at the sociopath’s facebook account. The point is to give yourself space to stop thinking about the sociopath. The onslaught of suppressed emotion can be overwhelming. I found it helpful to take one feeling at a time, get to know it, and then let it go. It is not a short process, and the feelings will keep returning, but by accepting them and examining them, they will become less intense over time. Your home should be your safe space. The fact that you are afraid to let anyone in and are not comfortable there means that you have not made it your safe space. Your abuser has tried to put her stamp on the place, and you are still feeling this. You need to exorcise her from your home. If you are religious, maybe you can have a member of your religious group perform some sort of blessing. If you are not religious, make up some sort of ceremony that feels good to you to exorcise her, like drawing pictures or symbols that represent her, burning the pictures and flushing the ashes. If you have objects that remind you of her, get rid of them or alter them to make them your own. Make sure your house is clean, then do what you can to make it homey. Get some cheap paint at the hardware store (returns/mistakes in the paint department are pretty cheap)and decorate that plywood so it isn’t so depressing. Be creative with furnishings and don’t be afraid to pick up curbside treasure. It is amazing what some paint and thrift store fabric will do, and the challenge of making something new out of something old will take your mind off of the psychopathic mumbo jumbo running through your head. Right now is a good time to be alone. Give yourself permission to be alone and happy. Tell yourself every day how much you love yourself and how great you are, even if you don’t believe it. When you feel lonely, think about exactly what it is that you want from other people – conversation? about what? activities? or just a warm body in the room? Once you know what you miss, you will have a better idea of what to look for in a friend. You can do this. You are worth the effort it will take to recover from this abuse. Think of all the energy you wasted on her and compare it to the energy you are spending on yourself right now. That will help you realize that you don’t need to feel bad about the time you are taking for yourself. Seekoflight, what you are describing is what all sociopaths do = lecture, interrogate, sleep derive their victims etc etc. This is how they take over everyones minds (mind control/brain washing) & have compete control over their victims. Such a scary world when you think about it in the big picture. My ex would lecture everyone none stop and everyone would listen….I would be sick of hearing the same lectures over and over. When I had proof of one of his affairs I was done with the marriage…but he sobbed, begged me to stay, said he would do “anything to save the marriage”….we went to marriage counseling (what a joke that was) during this time he would not let me sleep & he would intentionally pick fights on the way to the counseling office so I looked like the unhinged person in the marriage. Like you I look back and even though I wanted to leave every day of the relationship even prior to marriage he controlled my mind and I look back and think how stuck I was in my mindset & it makes me sad that I did not listen to my gut. But the reality is your brain can be in prisoned just like you can be physically be in prisoned. But the bottom line is we are not taught about the brain washing, mind control, gas lighting abuse, reward & punishment, we are not taught that someone intentionally tries to control your mindset for their own gain. You state “In my head she is still there…”….this is what every vicim goes through when leaving a sociopath…they have controlled our minds for so long…they have planted seeds that you only think of them and their needs. This is the addiction (routine) you have to break free of. The number one way is going full no contact with them. That means not looking at their social media. YOU KNOW WHAT SHE IS DOING = conning people, abusing, manipulating, lying etc etc so there is no need to look at her social media. Once you look at things this way you will realize you don’t need to see what she is doing…remember she is a miserable person…she is a sociopath con artist. Every thing you do now you need to be mindful aware to break the addiction she created within your mind to think about her. it’s not easy at first but you need to focus & be aware of your thoughts and when you think of her you need to be mindful to shift your thoughts to YOU to your life. An example of this mindfulness is if you go out for a walk don’t be in your mind (in your thoughts) look at the trees and say to yourself what you like about that tree or see the flowers and birds and make your mind think of those things. This will help you to get out of your mind and see the world again that you have been brain washing to not see. You have to retrain your brain to see the outside world…something that your cult leader prevented you from doing. You have to retrain your brain to your old way of thinking. You have to undo the brain washing she did to you. This all takes time, it will not happen over night but the sooner you are aware of what you need to do to clear your mind from her the sooner you will be mentally free of her. I will post Steven Hassan’s Bite model with regards to how a person mind controls someone else. This is what all sociopaths do to their victims. They are cult leaders like I stated before and you now have to open up your mind. Steven Hassan is a leading cult & domestic abuse expert who has been on 60 minutes, Larry King Live, CNN, FOX news, The John Walsh Show. Is book is Freedom of mind. 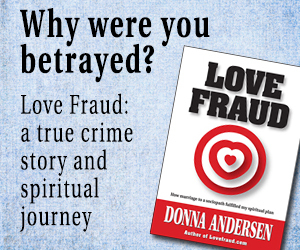 If you do a search on Lovefraud Donna Anderson did a book review on this book. For me it is a must read book for everyone leaving a abusive relationship with a sociopath so that they fully understand that they were mind controlled during their relationship. Dear seekeroflight, your story is inspiring. You have survived a classic sociopath – no one can imagine how destructive they are unless they’ve been through it. You seem to have some resources – financial and social. Sounds like you need one good, creative friend to come over and help you fix up your place a little so you like it better. Maybe you have a friend who would actually really enjoy doing that! It’s normal to feel shame after what you’ve been through. You have swallowed so much of her energy, her words, and her criticisms. Time to give it all back. It’s a process. Blogging here was so helpful to me when I was going through it. Here is Steven Hassan’s “Bite Model” on how a cult leader domestic abuser mind controls their victims. Great list, but it sounds like it is biased against some traditional practices of Eastern religions. Legitimate traditions aren’t the same as cults. Never give up your power of choice to anyone else. Ironically, I had a brief experience with a cult…in Mexico while studying there. I like to joke that I’m the only person stupid enough to travel to Mexico to study spanish and end up in a cult. It was a very brief but very traumatic experience, with a group which is widespread in Mexico but not really known about in the USA. At some point I will have to write an actual thing about that experience too…Also about the stalker from high school and early college. It’s funny, I mean, there is obviously a pattern here, right? It’s not like I’m unaware of the pattern. I have a good amount of crap in my past. I just thought my ex was going to be a person who would help me heal from those things – that’s certainly how she presented herself. And then she was the worst one of all. I’ve been doing a lot of reading about having an addiction to relationships. I relate to that quite a bit in some ways, and I know I’ve gotten a lot better with that especially this year. However, it’s hard for me to differentiate between what is a healthy want and need of having relationships with other people and what is an unhealthy want and need of relationships. It kind of makes me want to avoid everyone altogether and question myself whenever I feel like I would like to spend time with someone. I’m talking even friends, not romantically. How do you know the difference? How do I try to not be unhealthy without just completely isolating myself? Is it ever not unhealthy to feel lonely? I feel like this should be so easy, and it’s just not. I feel like an idiot. Great questions, seeker. I think it’s important to feel comfortable spending time alone and getting to know yourself in order to know when other people’s energy is draining or uplifting. Then you can choose. 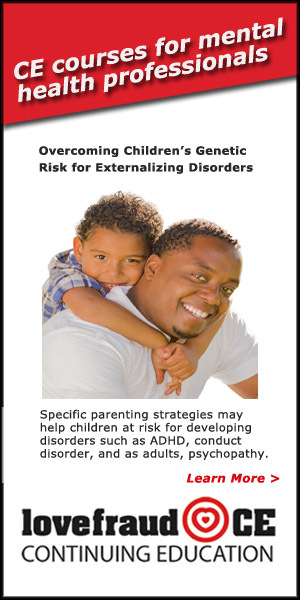 It’s also important to be able to recognize old unresolved needs from childhood. It was an epiphany for me when I realized I could meet these needs myself, allowing me to have healthier and less co-dependent relationships. These days I spend a good amount of time alone, and I enjoy it. I meditate frequently and guard my energy carefully. I love helping others and doing for others, but if it feels like a drain, I stop. This is especially true in my massage practice. 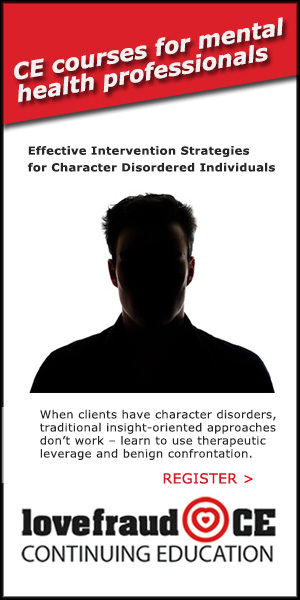 I have fired clients – even regular paying clients – when they become a drain on my energy for whatever reason. This is so hard. It’s so hard when you already feel subhuman. When you feel like you began the race three laps behind, and the race is only four laps total. And having some awareness of what those unresolved childhood needs are doesn’t seem to do much, at least for me, to make fulfilling them seem more attainable. seekeroflight, I am very moved by your postings. Your reaching out here is a huge first step in your healing. Trust that you are on the right path, and you will get to a very good place, in time. You are receiving a lot of excellent support and advice already from the several people who have responded to you. I don’t have much to add, other than another voice saying, you can do this, you are worth it, you are not alone. Keep going, do the no contact, keep reaching out for support. Absolutely ignore the naysayers, anyone who is negative, anyone who makes you feel like crap, anyone who judges you in any way. You will find your own way out of this. There is no one, right way. But there are many people who have done this before, so take heart, it is absolutely possible and certain to recover, once you decide to go in a good direction and cast off the old, negative patterns you found yourself caught in. It is not clear to me, your spiritual leanings, so I will only mention that I have found it to be true, that “spirit” is at the heart of the matter. If you are drawn towards positivity and “light,” then that is the way out of this. First, go within yourself, find that spark of light there, and nurture/protect it so it will grow. Look for beauty. Turn away from ugliness and strife. That is a good way of getting stronger, of knowing yourself, and eventually not allowing anyone — ever — to control you in the ways you have found yourself controlled. 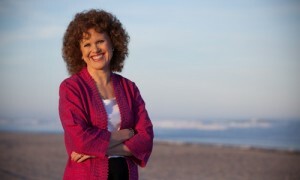 Jan7’s words about adrenal fatigue are very wise. Nurture yourself physically as well as spiritually. You have been so busy taking care of everyone but yourself. As they say on the airplanes, put your own oxygen mask on FIRST, then put the oxygen masks on your children. You cannot take care of anyone, if you are not also taken care of. Even if YOU are the one taking care of you (without anyone’s help) — it is not selfish in a bad way. It is extremely important. Be responsible for yourself, and others should be responsible for themselves, rather than being dependent on you like parasites sucking all the life out of you. Don’t allow that — it is not good for you. I can tell you are a wonderful, loving and kind, generous person. I am sure you will be OK — it sounds like you are financially resourceful. Oh my goodness, to be taking care of so many people. Make yourself very, very strong and then if you want to return to taking care of others, you will be in a much stronger position, to be able to do so, without becoming depleted in the process (spiritually, energetically, physically). Thanks so much for the kind words. It helps to hear people say things will get better, because some days they feel like they won’t. Ever. I’m having a few days like that right now. It’s like my mind is replaying every moment from the last 7+ years, making me relive each one in light of the knowledge I now have of who and what my ex is. It’s horrifying and exhausting. I feel like every moment I’m losing another part of myself. And I can’t make my mind stop. For awhile I was just so preoccupied with getting the protective order and figuring out financially how to survive the next day or week or month, and now that those needs aren’t quite so pressing anymore there is nothing to keep the other thoughts on the back burner so to speak. And I’m spiralling downward right now. I don’t even know how to explain how horrible I feel. I don’t understand how it can ever not hurt this bad. It feels unending and completely overwhelming. I meant to also add…I am really trying to get my health in order, b/c I spent a long time neglecting it in order to try to get health care for my ex who did have some significant health issues (real ones, in addition to the ones she made up). I just saw my eye doc last week (first time in a couple years), have gotten back in to see my chiropractor regularly again and I see her in two days for my first appt for nutrition response testing (which I have wanted to do forever but made sure my ex got to do so first b/c her health was worse than mine…although she did everything possible to sabotage her health as well regardless of what I did to try to help her), I got a good local psychologist, and I see my new primary care doc next week. Need to get a dentist appt and I’ll be mostly set until I can get a referral for a new sleep specialist. I am trying to do the things I need to. I have put all this on the back burner for so so so long. Congratulations on taking care of yourself. I was made to feel guilty for so long about not always being in perfect health that it is still sometimes a struggle for me to put myself first. I am glad that you cut ties with the ex. Concentrate on caring for yourself. I wish you well. Thank you so much for sharing your story. My story is similar in so many ways. People don’t want to hear it and it sounds too unbelievable. And it’s long and complicated. I filed an eviction and it was pure hell. Then when I fought him I got arrested and the judge put him back in my house and ordered a no-contact order so I couldn’t even go to my own house. He filed an affidavit saying that I broke the order so I had to close my business and go to jail for something I didn’t do. Then he filed a restraining order so that I would never be able to go back to my own house (which he turned into a bachelor pad). Anyway, yada yada, same sob story which no one cares to hear about. Right now my Spath is using the court system to his advantage to destroy me. I finally have my home back (minus everything he stole) but gave up on the legal system because cops are charmed by the Spath and will not be helpful. And fighting in court is expensive and exhausting. I’m trying to walk away and cut my losses, but I’m feeling all of those things you talked about. I am trying to run a business but it’s very hard to function so am pretty sure I’m going to have to close down. I don’t want Spath to win but I also know he is wired wrong and it may be better to just close up and leave town. I’m trying to find a therapist who understands Spath’s destruction of my head, heart, health. He has everyone charmed. The women who he hates and tries to destroy are the ones he lived with and finally said no to him. Anyway, it’s good to hear you’re doing better. I hope to get at least that far. I feel totally duped AND so stupid. And trying not to be so mad at law enforcement for taking his side everytime. They were charmed by him on the spot all the time. Twiceinalifetime, hugs to you! WOW what a nightmare of a story. What you are describe is what so many other victims have endured. It’s shocking how our judges & legal system are so clueless about con artist sociopaths even when they are right in front of them and they help the sociopath further destroy the true vicim life. I am so sorry that all of this has happened to you. Look at the site One moms battle & for support look at their Facebook page. Open a fake email then a Facebook page so that you can chat freely & safely. 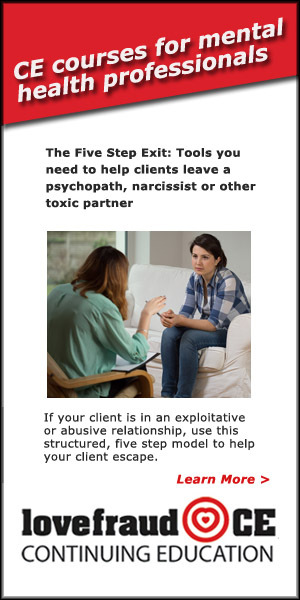 This site is mainly for child custody but they also help others who are dealing with a sociopath in court. It is a God send site. One of the first things you should do is get a court ordered mental examination on your ex. Ask the site creator on One moms battle Facebook page to guide you. 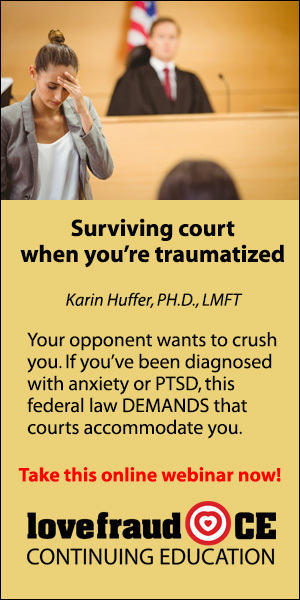 THIS WILL SAVE YOUR LIFE because once the court sees he is disordered then things will shift in your favor. It also might help to have your convicted over turned. Also on one moms battle they list lawyers who “get” personality disordered people and will know exactly how to deal with your ex in court. IF you don’t see your city listed with any lawyers just ask on the Facebook page if anyone has a good lawyer & ask the question how do you get a mental evaluation ordered by the court. You are right about walking away sometimes is better then trying to win a fight with a sociopath. Remember the sociopath is all about winning and they love that they are able to con a judge! Again, I am sorry that you are dealing with such a nightmare. HUGS!! 🙂 wishing you all the best! !